After learning of the horrific attack at the Boston Marathon yesterday, it quickly dawned on me that my dear friend Kate was at the event. 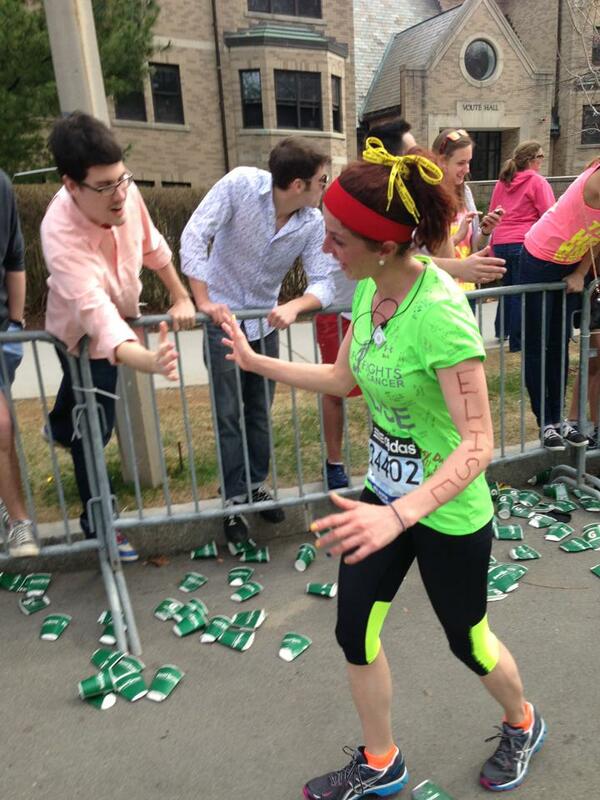 I learned that she was OK, but less than a mile from the finish line before the bombings. Being a Bostonite and avid marathoner, the attacks particularly hit home for Kate- as it did for many of us. Kate asked me to share with you her account of what happened yesterday and to implore you to focus on all the stories and images of good circulating the web. You can read more of Kate’s writing here. We live in a smartphone world. You can order food, deposit checks, and stalk your ex all in one finger swipe. Unfortunately you can also access horrific images without even getting out of bed. There are countless eyewitness accounts out there surrounding the tragedy of the Boston Marathon. I wasn’t a registered runner but part of the bandit tradition. 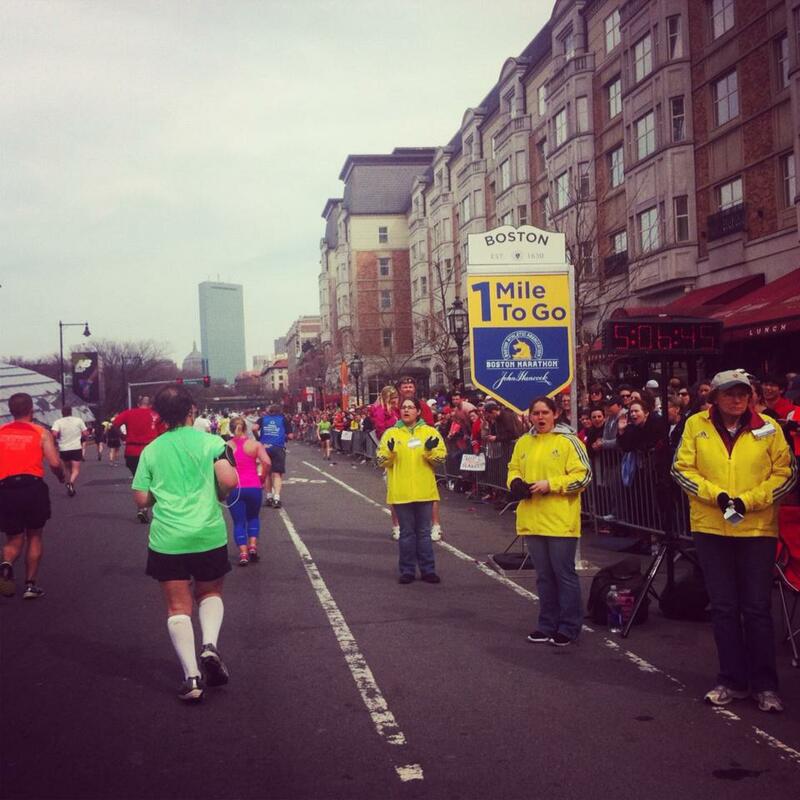 I waited at the light at Chestnut Street and Comm Ave. to join my friend on the dreaded Heartbreak Hill. It was her first marathon, and she had raised $5,000 for the charity “Voices of Hope.” She wore a neon green shirt with her name on the front, the charity’s name boldly printed on the back, and the names of cancer survivors, cancer patients and those who lost their battle to cancer scribed in between. The shirt also bore good luck messages from friends, families and the middle schoolers we work with. Her shirt alone represents the good that exist in this world, and the best part about it was that it wasn’t unique to the runners on the course. As I waited for her to come into view, I was able to see a tiny portion of the shirts worn by the estimated 2,500 charity runners. Countless messages of inspiration ran past: people running for loved ones, people running for strangers, people wearing messages of their own battles conquered, as a woman who wore a shirt that announced, “I am the face of arthritis” and people running to honor the memory of battles lost, to heal their grief and contribute hope to the future. People ran in zebra suits, tutus, plush hamburger belts, hotdog costumes and even Crocs. The crowd screamed any name that came into view, whether a charity name, the name of a college or a name written in sharpie on the arm of a determined runner. One man even wore a shirt that read “Sooee, sooee” to encourage the crowd to hog call. I recalled my first Boston marathon injuries from 2008: blistered fingers from ringing a cowbell furiously, a sunburned neck and voice that was no longer. I was just a spectator then. I rocked, chomping at the bits to join these runners and false started at every neon green shirt that came into view. When I saw my friend Elise, I shot into the crowd screaming, “Let’s do this!” Elise had over 18 miles under her belt already and was elated by the crowd. Boston will do that to you. I got to witness the other side of the marathon- the receiving end of the energy. I told her my favorite running quote of all time, “If you are losing faith in humanity go out and watch a marathon.” I told her, “This is the good in the world,” as we passed a man on stilts walking 26 miles for a children’s charity. We listened to various versions of Elise’s name (Elsie, Alice, etc) and acknowledged each one. We slapped the hands of college students until our hands hurt. We chanted USA and screamed with our hands above our heads. I took pictures and videos and these will be the images of my eyewitness account. My original plan was to jump out of the race around mile 23, but I physically couldn’t. It would be like leaving a party at 7 pm. I wanted to stick it out and witness my friend’s moment of crossing the finish line of her first marathon. 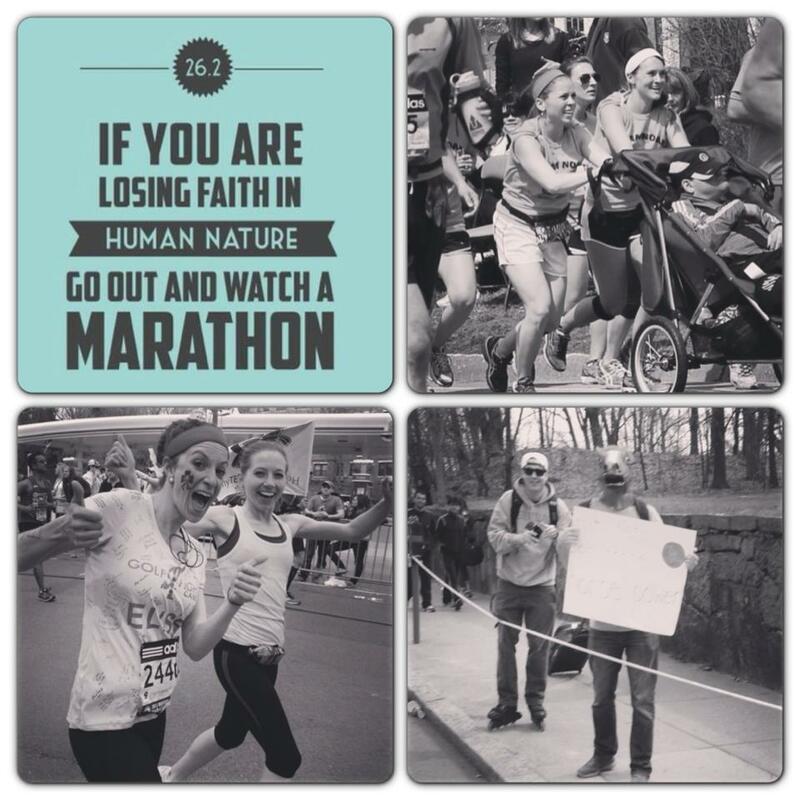 I wanted to soak up the crowd and take in every moment that is Marathon Monday. We were stopped less than half a mile from the finish line. We already have plans to go back to that spot so Elise can officially complete Boston. Elise deserves her moment as do all the runners who committing to countless hours of training and fundraising. 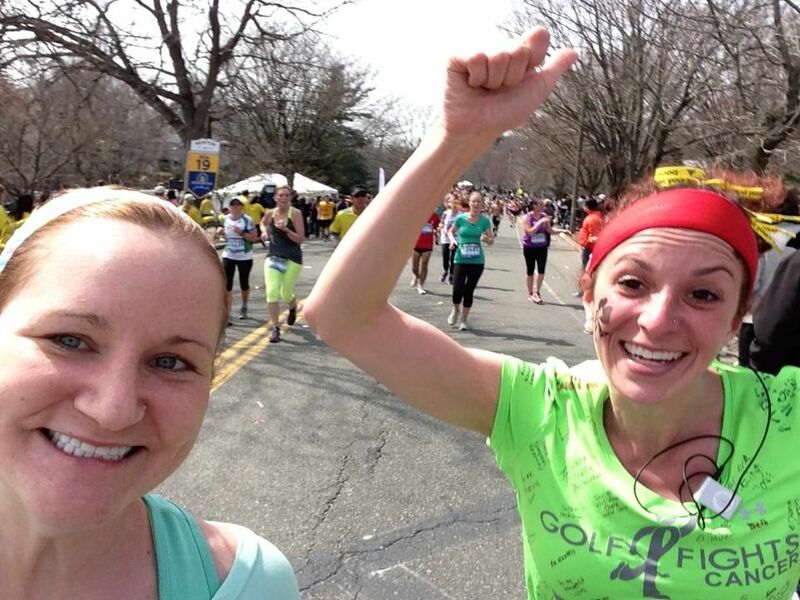 We are already committed to run the 2014 Boston Marathon. I know I’ll have to raise $5,000 to run as a charity runner for our school district, but I am determined that is possible now more than ever. People want to help; people want to do good. Please don’t define Marathon Monday by the vicious act of one, but instead by the inspiring acts of thousands. The world isn’t a sick place- there are just a handful of sick people in a beautiful crowd of millions. I urge everyone with every ounce of my being to avoid the photos of the tragedy that plaster the Internet. The images that we all need to see right now are the euphoric faces of the runners, the crowds ten people deep, Team Achilles featuring runners with artificial limbs, the runners in their 80s, the runner’s pushing wheelchairs, Team Hoyt, or the couple who married just after finishing. Please share any positive pictures and stories that you have from Monday. These are the images that restore your faith in humanity- the images that represent the marathon, the images that are Boston. Thank you for your first-hand account. As a marathon runner who aspires to qualify for Boston, I immediately thought of the thousands of runners who were denied their moment to cross the finish line. Of course that is a small tragedy compared to losing life or limb, but I get it. I am so glad that you are committed to run next year. My hope is that this horrific event will not change the spirit of the Boston Marathon, and all it stands for. Thanks, C.M.C.! I’ll make sure Kate reads your message.